In 2010, Myanmar’s ruling post-junta government, newly relocated to its planned-city capital in Naypyidaw, announced that it would release Daw Suu Kyi from house arrest, as part of an effort to relax its heretofore utterly hostile policies regarding democracy and economic liberalization. Other political reforms undertaken by President Thein Sein include removal of some of the regulation regarding media censorship and halting the construction of the Myitsone Dam, a $3.6B hydroelectric power project in Myanmar’s northern Kachin State – a bold move that surprised Chinese investors and the Kachin locals who “vehemently opposed” it. Much of the world celebrated and the United States wasted no time in sending in its political bosses: in late 2012, then-Secretary of State Hillary Clinton and President Barack Obama visited with Daw Suu Kyi and members of Parliament (one-quarter of which must, under the new “relaxed” laws, be appointed by the military). The two also visited the spectacular Shwedagon Pagoda, in a symbolic and historic gesture of respect (dutifully removing their shoes as they entered – though the Secret Service was reportedly a bit more stubborn, and only removed their shoes after a scuffle with the pagoda staff. Luckily they chose more wisely than the British colonizers of times past, who trod their filthy military boots all over the complex in a deliberately offensive move). The Shwedagon shimmers in the October sun. Photo by Sarah Ngo. In a better world, the changes that accompany and are symbolized by Daw Suu Kyi’s release would preempt an absolutely miraculous economic recovery, after decades of strangling (and highly botched) socialism (Myanmar slipped from being one of the region’s wealthiest nations in the 1960s to the poorest in 2010, with a GDP per person of only around $1300 (PPP – purchasing power parity). In 1987, Myanmar received the unenviable United Nations status of “Least Developed Country” – other “LDC” title recipients include Haiti, Afghanistan and the nations of most of central Africa – a title which has yet to be upgraded to “Developing Country”). Land prices in Yangon often rank above those in Manhattan, and foreign investment is pouring into the country – the current fiscal year (2014) saw foreign investment triple to $3.6B, according to a recent report by the Bangkok Post. However, political conflicts threaten to hinder these gains for Myanmar. Separatist wars still rage in at least 5 of the country’s 14 states, with hundreds of thousands of refugees living in camps scattered throughout Myanmar, India, Thailand, Laos, China, and even Bangladesh. Daw Suu Kyi is still ineligible for presidential office owing to a clause in the constitution barring persons married to a foreigner or who have foreign children (her late husband was a British citizen and her two children still hold British passports). And worst of all, ethnic violence, mainly between the Buddhist Rakhine and the Muslim Rohingya, regularly brings death and destruction to communities in central and western Myanmar (the Rohingya receive almost no protection from the government, as they are not recognized as citizens, but thought of as illegal immigrants from Bangladesh). Bricks of cash. At the time of writing, the largest denomination of kyat, Myanmar's currency, was equivalent to around $5. This pile of money was used to buy a few domestic plane tickets. It was under these circumstances that I was asked to lead the International Community Engagement Program (ICEP)’s visit to Myanmar in 2013. ICEP is a branch of Music Sharing, a non-profit organization founded by world-class violinist and U.N. Messenger of Peace Midori Goto. Each year, Midori takes three other young string players to a developing country in Asia and gives concerts in hospitals, orphanages, schools, special needs facilities, and community centers. The goal of the program is really two-fold: first, to bring some kind of emotional healing through live classical music to less-fortunate populations in the world; and second, to teach young professional musicians the importance of cultural exchange and community engagement. Having led the program in Bangladesh in 2012, I was familiar with the program’s activities and felt confident I could plan a decent program in whatever country was assigned. 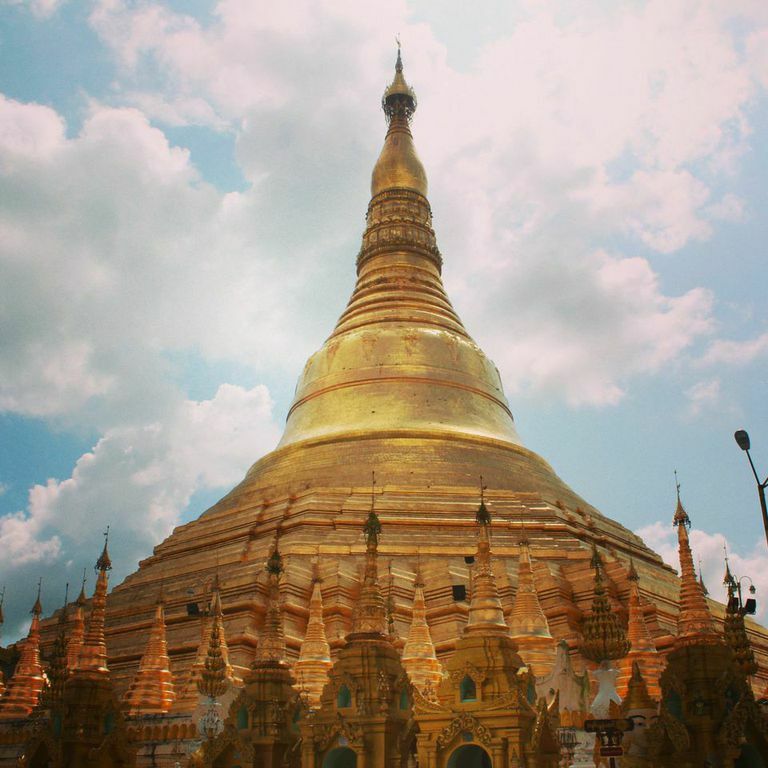 But at the time of accepting the responsibility, my knowledge of Myanmar was grimly inadequate. I imagined only a dark, violent rogue state: I had heard of the landmine danger near the border of the Chittagong Hill Tracts, where we visited in 2012, and had only a brief knowledge of the forced house arrest of Daw Suu Kyi, mainly thanks to the fact that one of my favorite songs as a teenager, U2’s Walk On, was dedicated to her. I also had vague memories of hearing about a cyclone in 2010 (I admit I did not realize the scale of Nargis: more than 130,000 perished – on par with the 2004 tsunami in other Southeast Asian nations!). To fill these rather egregious gaps in my knowledge, I started absorbing as much as I could about Myanmar. One of the first issues we confronted as an organization was whether to refer to the country as Myanmar or Burma – a problem that presents itself to anybody who does business with the country. Most politically neutral maps refer to it as both: “Myanmar/Burma.” Myanmar was the name given by the military government in 1989, being an older term and one that avoids, in the military’s view, the ethnic sensitivities that are touched upon by the word Burma. Bamah – from which we get the colonial word Burma – is the name for the largest ethnic group, comprising probably around 60% of the population. It is, however, difficult to know for certain, given that there hasn’t been a census since about 1983, and the current census-taking attempt has been extremely controversial since it forces the population to choose their ethnicity from an “anachronistic, inaccurate, and divisive” list of 135 ethnic groups, some of which are incorrectly categorized. “For example,” The Economist points out, “there are 53 Chin subgroups, many of which the Chin themselves do not acknowledge, raising old suspicions that the census results will be used by the Burmans to keep the Chin politically divided and thus weaker”. Other ethnic groups include Kachin, Shan, Karen, Mon, and the Rakhine, and ever since Myanmar’s independence from colonial rule in 1949, there has been strife between the Bamah majority, who dwell mainly in the Irrawaddy river basin, and the minorities, who dwell mainly in the hilly regions and who, under the Panglong Agreement (created between them and General Aung San – Daw Suu Kyi’s father), were promised full autonomy that has since been mostly revoked. It was disregard for this promise, particularly by Ne Win’s military government, that led to the armed conflicts in so many regions that continue today. It is ironic then, that Burma has become the preferred term for those fighting for democracy, under whose leadership the peripheral ethnic groups would ostensibly be represented fairly. We ended up choosing to refer to the country as simply Myanmar, mainly because, in addition to the reasons listed above, that is what the United Nations uses, and also because we, like President Obama, wanted to believe that the changes in the country of the last few years were real. My first source for finding contacts in Myanmar was the incredible Asian Cultural Council (ACC), where I worked as a research assistant for about 15 months while I was a student at Juilliard. The ACC is a sister organization to other pillars of Asian-American cultural exchange: the Japan Society and the Asia Society. All three of these owe their current existence to philanthropist John D. Rockefeller 3rd, who, along with his wife Blanchette, had a strong affinity for Asian art and culture. In the Rockefeller Archives at Pocantico Hills north of Manhattan are amazing materials demonstrating John D. Rockefeller 3rd’s connections to Asia – Japan in particular: correspondence with the Japanese Imperial family; photos of Mt. Fuji; photos with Edwin Reischauer, the man often (though mistakenly) credited for persuading the U.S. government to spare Kyoto from the firebomb raids of 1944-45 due to its cultural significance (he was ambassador to Japan in the 1960s); and many pieces of Japanese art that he (JDR III) and Blanchette collected throughout their lives. What began as a Japan-U.S. residency program for Asian artists in 1963 (among the familiar artist names of participants in this program is one of my heroes, Toru Takemitsu) evolved into the current Asian Cultural Council, which gives grants to support individuals and organizations engaged in cultural exchange with Asia. Having supported grass-roots arts organizations in Myanmar over the past few years, ACC’s first recommendation was to contact a music foundation started in 2003 by a certain Ms. Kit Young, called Gitameit. Gitameit literally means “music friendship,” and is a very friendly organization indeed. Kit Young grew up in Thailand studying Thai instruments, and has spent much of her life pursuing a career “as solo and collaborative pianist, composer and teacher organizing concerts, festivals and exchanges with Asian colleagues in both contemporary and traditional music from Thailand, Burma, Malaysia and China.” Perhaps the most unique facet of her career is her expertise in the Burmese Sandaya tradition (traditional Burmese music styles performed on the piano). Early on, Gitameit operated in Thailand, but now they have opened schools in Yangon and in Mandalay, with full boarding available to a small number of students from rural areas. They have wonderful and committed staff members, and are engaged with neighboring classical music communities in Southeast Asia (their best string trio, for example, had recently returned from Bangkok, where they competed on an international stage). We even had to schedule our concert program with them around their performance at the closing ceremony of the SEA Games (SouthEast Asian Games). And then, of course, with Midori being a semi-formal representative of the United Nations as a Messenger of Peace, we were able to plug directly into the U.N. network in Yangon and elsewhere in the country. I had the good fortune of becoming friends with the United Nations Information Centre (UNIC)’s representative, U Aye Win, who immediately took initiative and began approaching various UN groups, NGOs, and government officials to ensure that we garnered adequate support for the ICEP visit. He even welcomed my wife, her parents, and me as we visited in October during my pre-tour “scout” trip, taking us to several delicious restaurants in Yangon and going so far as to offer his beautiful wife’s cooking (mohingya noodles) in his own home. Because of U Aye Win’s enthusiasm, I was able to connect with one of the most remarkable individuals I have ever met – Daw Lahpai Seng Raw, founder of the largest civil society in Myanmar, the Metta Foundation, and recipient of the 2012 Magsaysay Award, the equivalent of a Nobel Peace Prize for Southeast Asia (and incidentally created and financed by the Rockefeller Brothers Fund). Her father was a state-level public official, and she “personally experienced the military’s abusive rule when she was detained on the suspicion that she had communications with her brother who was in the Kachin insurgency.” After the death of her husband, Daw Seng Raw has spent the rest of her life doing what her Christian beliefs would dictate: helping others. Her organization has provided relief for refugees of all kinds, and of all ethnicities, throughout all of Myanmar. Recipients now number over 600,000 in over 2,000 communities, and she has given many, many people on her staff the opportunity to develop professional skills and better their own futures. My first meeting with her was with U Aye Win in the Metta offices in Yangon. Her staff welcomed us with some dances representative of local tribes, including the charming harvest dance of the Shan. Our purpose in visiting Metta was to discuss doing an ICEP program in her native state of Kachin, where currently more than 100,000 live in IDP (Internally Displaced Person) camps – their homes, neighborhoods, or farms having been either destroyed or having become too dangerous to live in. We discussed the Midori visit for about an hour, deciding that it was best to avoid making the visit a political affair, and better pitched to authorities as harmless musical performance. A few days later, I met her in Myitkyina, the Burmese-controlled capital of Kachin (the KIA headquarters are near the Chinese border in a town called Laiza). As it so happened, the timing of my visit to Kachin in early October coincided exactly with a new, UN-and-Chinese-brokered round of peace talks. The Kachin conflict is among the hottest of the internal conflicts in Myanmar, and, while cease-fires have been declared time and time again, it seems that no real steps toward peace have been made. U Thein Sein’s government is of course eager to end the costly conflicts with each of the ethnic groups, but decades of war do not dissipate easily; too many have sacrificed too much in the resistance effort. (The Chinese are of course eager for peace to ensue, as they tend to bear the brunt of refugee populations fleeing north, and as their investors stand to lose much to dangerous internal conflict, as the Myitsone Dam situation aptly demonstrates). As I waited for Daw Seng Raw at my hotel, a man sitting next to me in the dark (the hotel only had electricity during certain hours of the evening) suddenly broke the silence and started a conversation in English. “American?” He asked. “Yes,” I replied. He then whispered to me, “I’m part of the underground.” I knew immediately knew what he meant, very aware of the fact that we were now in Kachin country, where participants in the war abound. Yet I wasn’t sure how to reply, not knowing what the risks were. He explained that he was in town to observe the peace talks from the shadows.